Instead of the usual Obsession Wednesday I want to let you guys know about two new bills that has been presented to Congress called Stop Online Piracy Act (SOPA) and Protect IP Act (PIPA). These bills that Congress will be voting on January 24 can severely limit and punish people for things we would have never thought could get someone five years in prison. They both are wrapped around copyright laws in which sites can be eliminated (i.e erased from the internet and no longer working websites) if it contains any copyright material. It may seem right, punish people who steal but they are not written out to punish criminals as it is presented. Sites like Google, Youtube, Facebook, Tumblr in which people quote lyrics,upload images and music can be deleted just because of one person. These bills are very vague and can hinder much more then just social network sites but also businesses. I could go on for hours about how under structured these bills are but I'll let you read more (here) and let you make your own decision on this. Thanks for contributing to the protest! I've been reading up on it and am convinced it would be a very bad move! Thanks for linking the petition! 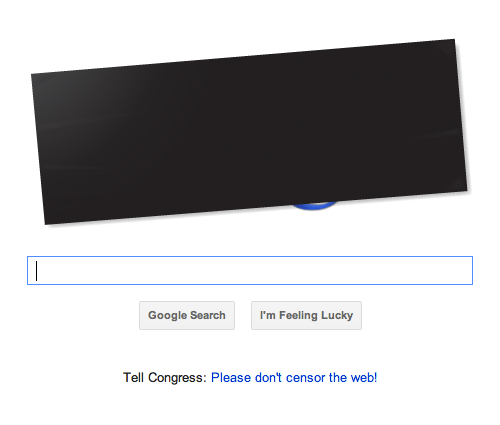 Like how can we consider the U.S. a Democracy w/ Censorship?? I am so upset. If this thing passes...I will join the riots!